Breastmilk is all your baby needs until at least four months of age. Most babies will do fine with exclusive breastfeeding until 6 months of age or longer. Because there comes a time when breastmilk no longer supplies all your babys nutritional needs. (This does not mean, as some uninformed people say, that there is no nutritional value in breastmilk after the baby is six months old.) A full term baby will start requiring iron from other sources by 6 to 9 months of age. The calories supplied by breastmilk may become inadequate by 8 to 9 months of age, although some babies can continue to grow well on breastmilk alone well past a year. Because some babies not started on solids by a certain age (9-12 months) may have great difficulty accepting solid foods. Because it is a developmental milestone that your child passes when he starts solid foods. He is growing up. Usually, he will want to eat solids. Why stop him? When to start solid foods. The best time to start solids is when the baby is showing interest in starting. Some babies will become very interested in the food in their parents plates as early as 4 months of age. By 5 or 6 months of age, most babies will be reaching and trying to grab food that parents have on their plates. When the baby is starting to reach for food, this seems a reasonable time to start giving him some. There really is no reason to start on a specific date (4 months, or 6 months). Go by the babys cues. In some cases, it may be better to start food earlier. When a baby seems to be hungry, or when weight gain is not continuing at the desired rate, it may be reasonable to start solids as early as 3 months of age. However, it may be possible, with help, to continue breastfeeding alone and have the baby less hungry and/or growing more rapidly. But if the techniques used in the clinic do not deal with the problem, adding solids can help. There is no advantage to giving artificial baby milk (formula) and there may be some disadvantages. The baby who is not satisfied completely at the breast may start to take more and more from the bottle, and end up refusing to take the breast. The breastfed baby digests solid foods better and earlier than the artificially fed baby because breastmilk contains enzymes which help digest fats, proteins and starch. As well, breastfed babies have had a wide variety of tastes in their lives, since the flavors of many foods the mother eats will pass into her milk. Breastfed babies thus accept solids more readily than artificially fed babies. Breastmilk is amazing stuff, eh? How should solids be introduced? When the baby is starting to take solids at about 5 or 6 months of age, there is little difference what he starts with or in what order foods are introduced. It is prudent to avoid highly spiced or highly allergenic foods at first (e.g. egg white, strawberries), but if the baby reaches for the potato on your plate, make sure it is not too hot, and let him have the potato. There is no need to go in any specific order, and there is no need for the baby to eat only one food for a certain period of time. Some exclusively breastfed babies dislike infant cereal when it is introduced at 5 or 6 months of age. There is no need for concern and no need to persist if the baby doesnt want the cereal. There is nothing magic or necessary about infant cereal. Offer your baby the foods that he is interested in. Allow the baby to enjoy food and do not worry exactly how much he actually takes at first. Much of it may end up in his hair and on the floor anyhow. There is no need either that foods be pureed if the baby is 5 or 6 months of age or older. Simple mashing with a fork is all that is necessary at first. You also do not have to be exceedingly careful about how much the baby takes. Why limit the baby to one teaspoon if he wants more? You do not need to waste your money on commercial baby foods. Be relaxed, feed the baby at your mealtimes, and as he becomes a more accomplished eater of solid foods, offer a greater variety of foods at any one time. The easiest way to get extra iron for your baby 5 or 6 months of age is by giving him meat. Infant cereal has iron, but it is poorly absorbed and may cause the baby to be constipated. There is no reason to introduce vegetables before fruit. Breastmilk is far sweeter than fruit, so there is no reason to believe that the baby will take vegetables better by delaying the introduction of fruit. Respect your babys likes and dislikes. There is no essential food (except breastmilk). If your baby does not like a certain food, do not push it on him. If you think it important for him, wait a few weeks and offer it again. What if I am starting solids at 3 months? At this age, it may be prudent to go a little more slowly. Start with infant cereal or easily mashed foods such as banana. Sometimes a baby will eat better from your finger than off a spoon. Go a little more slowly with quantities as well. 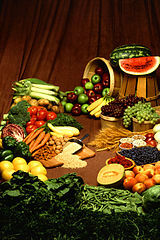 But as the baby tolerates solids, both quantity and variety of foods can be increased as the baby desires. Incidentally, why are you starting solids at 3 months? There seems to be considerable worry when a child is starting solids about whether to give the breast first or give solid food first. If breastfeeding and the introduction of solid foods both are going well, it probably does not matter much. Indeed, there is no reason that a baby needs both breast and solids every time he eats.